Photos: Courtesy of Bill Blass. It's no secret tulle skirts get a bad rap: One mention of the garment and your mind likely gravitates to memories of ballet recitals past, poufy prom dresses, itchy Halloween costumes, or tacky bridesmaid gowns you were forced to wear. Basically, it's difficult to conjure a positive connotation when it comes to these tutu-like pieces. Since this year is all about resurrecting trends we never thought we would (think: puffer coats and bodysuits), it's no surprise that the tulle skirt has gotten a modern-day makeover that's -- dare we say -- pretty cool. Sure, it may still feel very Carrie Bradshaw to casually throw one on in place of a pair of jeans, but the fabric's light, sheer nature actually lends itself to some epic layering. Plus, it's an add-on you likely won't find at Zara (yet) or see five coworkers also wearing. There's one brand in particular that's really showing how this look is done: For pre-fall (landing in April), designer Chris Benz at Bill Blass is making a serious case for this whimsical must-have. Scroll on to get tulle-d. 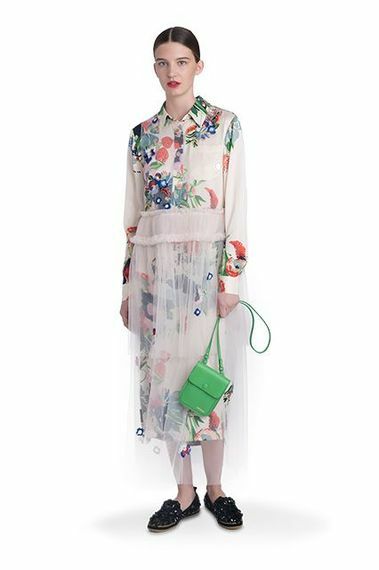 Play up a springy floral dress by layering a white tulle skirt overtop, allowing the pattern play to peek through. Balance a dramatic black tulle skirt with a pink baseball tee-style blouse for a more laid-back look. Sheer on sheer looks even better when there are stripes and skinny scarves involved. Amp up your usual colorblocking with tulle on the bottom and sequins on top. Who knew this pairing of textures could look so polished and sophisticated? For the rest of our SJP-esque picks, visit Refinery29.